Willie brought the news. His mother said, "Now what made you do that, Tad? Major Watt hoped to have them for the state dinner." I went out to view the despoiled plants. Watt was fuming, threatening to go to the Madam. "The Madam knows it," I said, "Willie told her," and as he seemed in a great rage, I added, "He is the Madam's son, remember." "The Madam's wildcat," snarled the head gardener. John Watt, who also had problems with the Lincoln pet goats eating the flowers, was "appointed Gardener for the Kitchen garden belonging to the Presidents House..." in a Jan 31,1852 letter. [National Archives RG 42]. Two years later, in May 1854, he was given control over all the laborers on the grounds of the Presidential Mansion, causing the Public Gardener to entreat the Commissioner of Public Buildings and Parks to write Congress to fund additional staff. 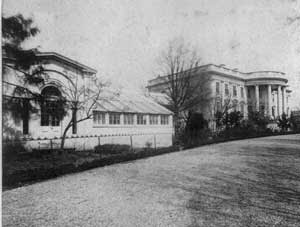 Watt's office was in the Conservatory on the west side of the White House. Photograph is c1867 from Library of Congress. In the very beginning of her book, Julia Taft wrote that "... during the Buchanan administration we had come to know him well. Mr. Watt delighted in showing me over the conservatory and grounds and introducing me to strange plants by their long Latinized names. ... [When told the children were to be playmates] ... he called up the stairs, "Here, Willie, Tad, here is somebody to play with you." There was no answer, but we went up into the conservatory and there stood the boys by the water-lily tank, watching the goldfish." When the War started in 1861, the Scotsman John Watt was suspected of being a southern sympathizer, but there were more serious charges, according to Sen. Browning's diary entry of March 3, 1862. "[Watt] suggested Mrs. Lincoln the making of false bills so as to get pay for private expenses out of the public treasury and had aided her in doing so, to such an extent that the president had to be informed of it, at which he was very indignant, and refunded what had been thus filched from the government out of his private purse. That Watt's wife was now nominally stewardess at a salary of $100 per month, all of which, by private arrangement, went into Mrs. Lincoln's pocket." Watt was dismissed in February 1862. For much more information on the White House gardens from George Washington through 1850 with many pictures, go to: White House Gardens & Grounds, the Sept 20 posting in Early American Gardens--a museum in a blog by historian Barbara Wells Sarudy, author of the great book Gardens and Gardening in the Chesapeake, 1700-1805.